This rotting apple is a delicious treat for Drosophila larvae. Photo by IAEA Imagebank via Flickr. Fruit fly larvae have one goal: eat as much as possible. 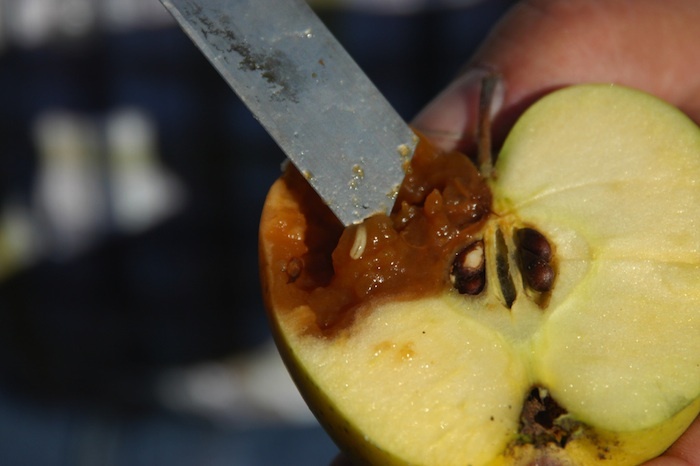 After the tiny worm-like larvae hatch from eggs embedded into the flesh of rotting fruit, they eat their way out. After days of gorging, they find a good spot to pupate and then emerge as adults. Fruit flies cannot grow after this transformation, however, so their body size is fixed by their larval feeding success. Since greater adult body size is associated with increased fitness, those first feasts are critically important. In a paper published in the February issue of GENETICS, Allen and colleagues use a precise knockout to show that multiple feeding-related traits in fruit fly larvae are controlled by a single gene. The gene foraging encodes a protein kinase that has two naturally occurring alleles —the rover and sitter alleles. Larvae with the sitter allele do not travel as far as those with the rover allele, and they differ in other food-intake related traits. However, the lab strains that carry the rover and sitter alleles differ across the entire chromosome that carries foraging, so these differences could be caused by variation in other genes physically linked to foraging. To precisely determine the phenotypes affected by the gene, Allen and colleagues generated a precise knockout using homologous recombination, enabling them to compare larval behavior in lines that differed only by this single gene. They also made a rescue construct containing the foraging sequence, which they introduced into the knockout to restore the wild-type phenotype. Finally, they overexpressed foraging by inserting this rescue construct into the wild-type background. Using larvae with these three genotypes, they quantified the effect of a range of foraging expression levels. The larvae that totally lacked foraging expression survived to pupation at a normal rate but failed to successfully metamorphosize into adults. A lack of foraging expression also affected feeding phenotypes. The authors tested whether larvae with the three genotypes differed in the how far they traveled through their food and found that those with the highest foraging expression traveled the most. They also found that higher expression of foraging correlated with consuming more food, though the larvae’s triglyceride content decreased with foraging expression. Clearly, this gene plays a critical role in several different feeding and metabolism related phenotypes. The authors suggest that foraging has the ability to control multiple phenotypes because of its transcriptional complexity;foraging has four transcriptional promoters and 21 different isoforms. It is currently unknown how the different isoforms are expressed or what their specific roles are, but the authors propose that tissue or developmental stage specific expression of functionally different transcripts could allow this single gene to affect phenotypes as different as feeding behavior and fat metabolism.